Sorry, I went quiet. Funny thing was, you know how I talked a while ago about not feeling able to go on holiday because I felt like, living here, I was meant to feel like I was on holiday all the time? Well, I did. And I was feeling like that. Because I like driftwood. And taking pictures. I also took pictures of other things. Oh, and video. 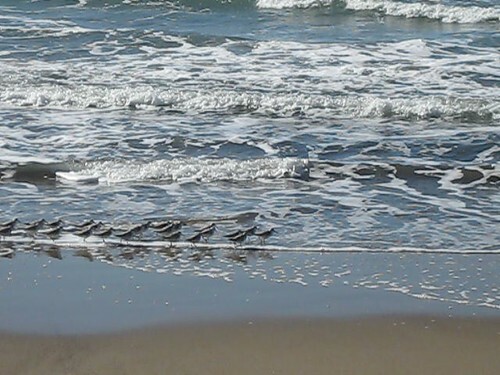 Because also the holiday was all about watching little sandpiperish birds running away from waves. Because they are great. And also, I decided, once more, that I need to be more committed. To my blog, I mean. Ive been working too many hours in too flabby a fashion, so I need to tighten up my work routine, and that also means making more time for blogging (on MY blog), because I love it and miss it, and because of other reasons. Time slips by too fast, and when I dont take comprehensive notes on it, I forget because I have a brain like a sea-colander. A sea-colander with adult-onset ADD. Anyway. So that is the plan. But yes. We went on a very little holiday, and it was very quiet, and that was that. And I will be back tomorrow (and every other day) with something more interesting than that to say. I know! I know! Ask ME!